A prisoner who fatally stabbed another inmate, who was days away from release, has been convicted of manslaughter. 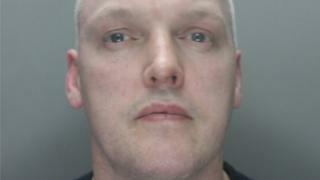 Keir Michael, 41, killed Darren Ashcroft, 35, in his cell at HMP Altcourse on 14 November, Liverpool Crown Court heard. The stabbing came just a month after a prison inspection report had warned about rising levels of violence in the jail in Merseyside. Michael will be sentenced at the same court on Friday. The court was told Michael stabbed Ashcroft in the chest with a thin piece of metal that had been sharpened to a point. The father-of-two had placed himself in front of Michael as he attacked his cellmate Terrence Roderick, 34. Rachael Barber, Senior Crown Prosecutor for Merseyside and Cheshire, said: "Keir Michael went into that cell with the intention of doing serious harm." Ashcroft's sister Kerry said: "We have seen no remorse from this man, we believe that he should receive a life sentence with no parole." The victim's fiancee, Joanne Thompson, said: "He was not a member of any gang and was within a week of being released so he would have been careful not to do anything at all that would have kept him in longer." She said the couple were planning to get married and move away from Liverpool for a new life. The HM Inspectorate of Prisons report had said "levels of assaults against prisoners and staff, bullying incidents and fights were high and rising sharply".